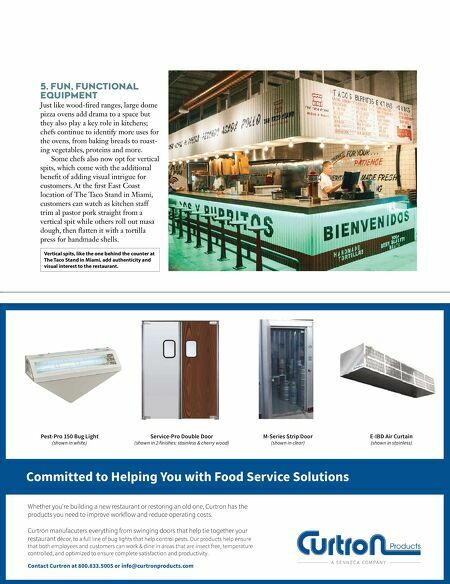 38 • FOODSERVICE EQUIPMENT & SUPPLIES • NOVEMBER 2018 Ten Ways to Elevate Great design, intent on elevating the guest experience, all starts with concept development and branding. "For us, branding is all about identifying the unique attributes of a restaurant or experience from the beginning to the end and making sure all of the moving parts work in unison," says Joseph Szala, principal and creative director of Vigor, a restaurant and beverage branding •rm. "We also have to remind our clients that the brand experience isn't just for customers and guests, it's also for the employees." Everything from the entryway to the color scheme, packing, food presentation, and tabletop selection must all match the de- •ned brand. "You can't just slap a logo up on a wall and call it a day," Szala says. Here are two of his recent projects as examples of more thought-out branding. 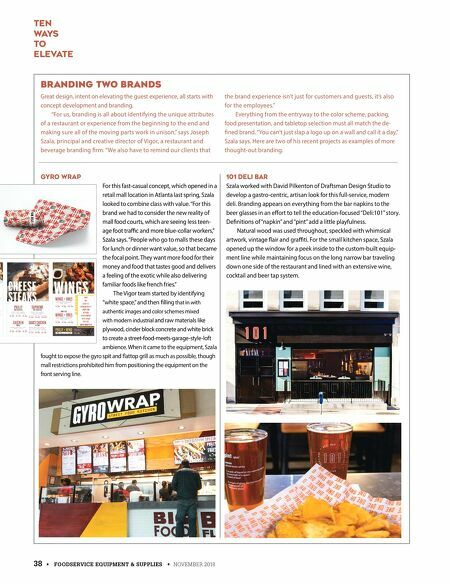 Branding Two Brands Gyro Wrap For this fast-casual concept, which opened in a retail mall location in Atlanta last spring, Szala looked to combine class with value. "For this brand we had to consider the new reality of mall food courts, which are seeing less teen- age foot tra†c and more blue-collar workers," Szala says. "People who go to malls these days for lunch or dinner want value, so that became the focal point. They want more food for their money and food that tastes good and delivers a feeling of the exotic while also delivering familiar foods like french fries." The Vigor team started by identifying "white space," and then •ll ing that in with authentic images and color schemes mixed with modern industrial and raw materials like plywood, cinder block concrete and white brick to create a street-food-meets-garage-style-loft ambience. When it came to the equipment, Szala fought to expose the gyro spit and ‰attop grill as much as possible, though mall restrictions prohibited him from positioning the equipment on the front serving line. 101 Deli Bar Szala worked with David Pilkenton of Draftsman Design Studio to develop a gastro-centric, artisan look for this full-service, modern deli. Branding appears on everything from the bar napkins to the beer glasses in an eŒort to tell the education-focused "Deli:101" story. De•nitions of "napkin" and "pint" add a little playfulness. Natural wood was used throughout, speckled with whimsical artwork, vintage ‰air and gra†ti. For the small kitchen space, Szala opened up the window for a peek inside to the custom-built equip- ment line while maintaining focus on the long narrow bar traveling down one side of the restaurant and lined with an extensive wine, cocktail and beer tap system.